So you’ve just arrived, and you’re trying to figure out what is there to do around Juneau from a cruise ship. Don’t worry, this is how most people arrive: with a few hours or few days to kill, and not much of an idea of what exactly to do. Well, never fear, we’ve got you covered. Whether you’re in Juneau for a short or multi-day stay, we’ve put together a list of some of the best things to do around town. Starting with the obvious, Mendenhall Glacier is arguably Juneau’s only must-see attraction. It’s also pretty easy to cover on a limited timeframe. This half-mile wide glacier offers some of the best views anywhere in Alaska. From the ferry terminal, there’s regular buses to within a mile or so of the glacier visitor center; alternatively, a cab can make the 7 mile journey a little quicker. From the visitor center, you can soak up great views of the glacier, or lace up your walking shoes for a hike. The most popular trail, Nuggest Falls, takes visitors past an impressive waterfall cascading off a mountainside near the glacier. When the weather gets bad, head over to the museum to warm up and get a glimpse into Alaska’s fascinating state history. The shiny new Alaska State Museum underwent a $14 million expansion in 2016, and it’s easy to kill half a day there. The meticulously produced exhibitions provide a wealth of information on everything from the state’s pre-colonial history, to Russian Alaska and the explosion of the oil industry. The museum is easily reached within a few minutes from the main ferry terminal. This stunning fjord can easily be done as a day trip from Juneau. You’ll have to book a cruise, but it’s worth it. If you’re lucky, you might see huge chunks of ice falling from the glacier, migratory birds and the occasional whales. This small island is home to well over a thousand bears. Naturally, it’s a great place for bear watching, and easy to reach from Juneau. Tours by float plane, cruise and even kayak are available from Juneau. If the State Museum didn’t hit the spot, try the Last Chance Mining Museum. This museum is housed in Juneau’s historic gold mining complex, and today serves as a reminder of the city’s days as a boom town. In its heyday, this was the world’s largest hard rock gold mine, and the backbone of the local economy. Reaching the museum is easy: just head to the end of Basin Road. You can’t miss it. The trailhead for this rewarding hike is conveniently located at the end of Basin Road, just near the parking lot of the Last Change Mining Museum. The trail takes hikers through Juneau’s abandoned gold fields. There’s still plenty of abandoned mine shafts around, so watch your step and stay on the trail. While Perseverance itself can be covered within a few hours, the trip can also be combined with the Granite Creek Trail and Mt Juneau Trail. Together, these various trails can offer a few days of exploration, with camping being possible. After all that walking, you might have worked up a thirst. The Alaska Brewing Company is the state’s largest brewery, and the amber ale it produces is beloved across the state. Tasting tours are available for $20, and are well worth it. The brewery is located outside the city center in Lemon Creek. A taxi is easily done, but your best option for transport is the free shuttle from outside their downtown store, the Alaskan Brewing Co Depot. The shuttle is free for anyone with a tour booking. If you visit Alaska, you need to visit a fjord. For anyone who doesn’t know, these icy inlets are waterways carved by the movement of glaciers. They can be found across the far north, from Scandinavian to Newfoundland. Perhaps we’re a bit biased, but some of the most picturesque fjords in the world can be found right here in Alaska. In particular, one of the best is just outside the state capital, Juneau. Pardon the pun, but Tracy Arm really is within arm’s reach of Juneau. Just 45 miles (72 km) south of Juneau, this incredible fjord can easily be done as a day trip. Daily cruises run throughout peak season, and it’s usually not hard to book in at the last moment. When you first arrive at the fjord, the biggest draw card has to be the imposing Sawyer Glacier. This tidewater glacier is quite active, and it’s common to see huge chunks of ice splitting off throughout the day. Make no mistake, these pieces of ice can be huge, ranging from car-size chunks to pieces that can even dwarf the cruise ships that ply the surrounding waters. If you’re not impressed yet, just wait for your cruise ship to cut the engines. This is a little trick most of the tours like to offer visitors. By plunging the cruise into silence, you’ll be able to hear the glacier crunching and groaning as it drifts. The sound is both beautiful and slightly terrifying, not to mention the best way to get a feel for the sheer size and power of the enormous mass of ice before you. Even better, Tracy Arm also happens to be a great place to see icebergs. Because the waters here are around 600 feet deep, meaning those crashing chunks of ice often remain intact even after hitting the water. This means the whole area around the fjord can sometimes be littered with lumbering behemoths of icebergs. If you’re still not convinced, bear in mind all this icy chaos is playing out against an absolutely stunning backdrop. Tracy Arm sits at the end of a landscape rippling with inhospitable mountainous terrain. Some of the peaks you’ll see are as high as 7,000 feet, which is pretty impressive given the fact you’re only at sea level to start with. These mountains are important sources of fresh water, and glimmer with half-frozen run-off. The region is also a good spot for catching a glimpse of Alaska’s wildlife. Along with mountain goats, bears and seals, the fjord is also the summer home of a handful of migrating bird species. In the right season, you can see Arctic terns, kittiwakes and the occasional guillemot. There’s a few eagles around that also sometimes like to make an appearance, and can be a spectacular sight for lucky visitors. Better still, the oceans around the fjord see their fair share of whales during the right season. Talk to your tour operator, and they should be able to let you know what your chances are of seeing a whale or two. As mentioned, it’s very easy to get a cruise from Juneau to Tracy Arm. Some of the more established operators include Adventure Bound Alaska, Above & Beyond Alaska and Allen Marine Tours. The best months to visit are June and July, when the weather is warm and the glacier is cracking left, right and center. Alternatively, any time between May and September is doable, though both early May and late September can see some stomach-churning rough seas. The best thing about Alaska is the people. Sure, America’s last great wilderness has no shortage of incredible natural attractions, a fascinating history and some of the nation’s best fishing, hunting and other outdoor sporting opportunities; but it’s the people who really make a visit to Alaska so wonderful. So, what better way to see Alaska than by staying with locals? Luckily, Alaska has a thriving B&B scene, with a good range of options and high standards. In fact, much of the state’s most affordable accommodation tends to be B&Bs, though there are plenty of high end alternatives as well. Stay in the heart of the action with a family in Anchorage, experience the countryside with locals or soak up nature in a rustic cabin – there’s pretty much something for everyone. Either way, a B&B can be a great way to learn a bit about local life, or just get inside information on the best fishing spot. B&Bs can also be a good opportunity to try some classic Alaskan food. 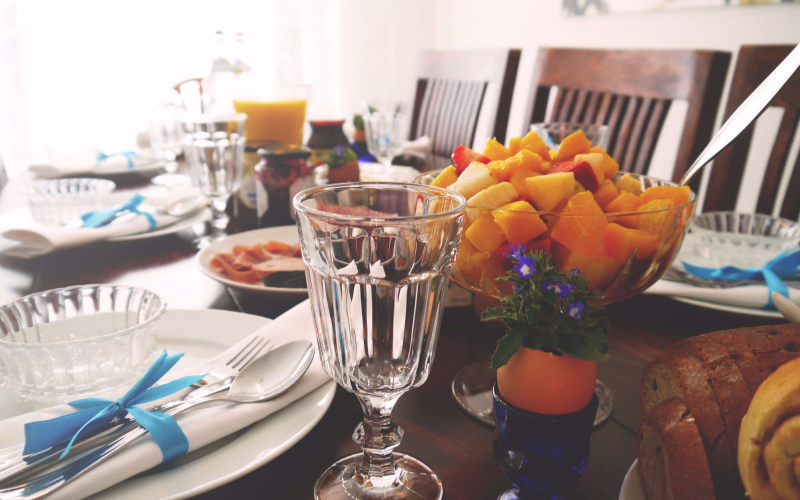 While there’s plenty of options that offer typical B&B staples like muffins, fruit or cereal, it’s always worth asking if there’s anything more interesting on the menu. Some traditional favorites include reindeer sausage and salmon quiche. However, for a truly Alaskan breakfast, you can’t pass up a generously portioned plate of wild blueberry pancakes with fireweed syrup. It’s perfect for anyone planning on spending the day seeing the sights, exploring the wilderness or just heading out to the woods for some lumberjack work. It’s also worth noting that like hotels, each B&B caters to its own type of traveler. In Alaska, you can find B&Bs ranging from upmarket businesses accommodation, to eco-tourist paradises. Of course, what makes Alaska’s B&Bs particularly unique is the state’s tradition of hospitality. Alaskans love guests, and when the weather gets cold, nothing is more important than a warm, welcoming attitude. Finally, there’s the personal service. You’ll never feel like just another guest in a building. B&B innkeepers like to helps people, talk with them and give the best insights on anything of iterest. Chatting with a local is always a great way of learning unique things about the area not to be found in brochures, and lead to entertaining personal stories that build relationships. At Beachside Villa B&B we love to treat our guests with care and courtesy. Our unique location ofters unparllel views of the Douglas Channel and is a quiet area where to relax at night. We look forward to hosting you! 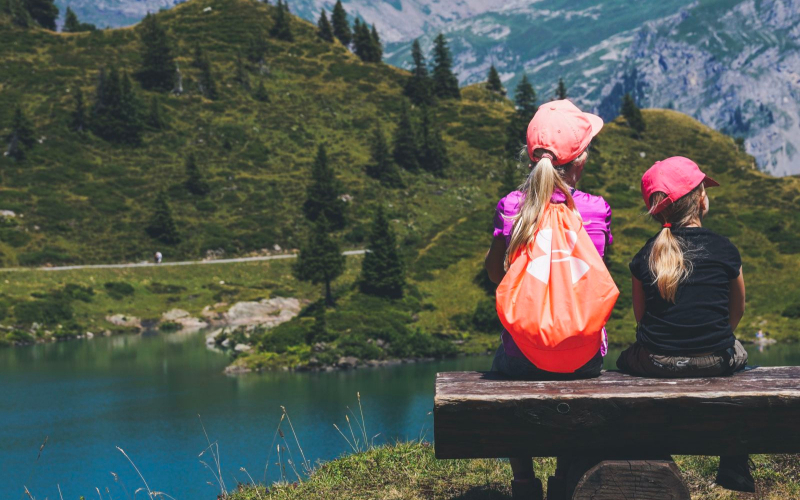 Whether you’re a visiting for a few hours or for an extended period, Twin Lakes Park offers amazing history, beauty, and opportunity for adventure. To ensure you do not miss out on anything this amazing park has to offer, below is a comprehensive list of sights and activities to partake in during your stay. 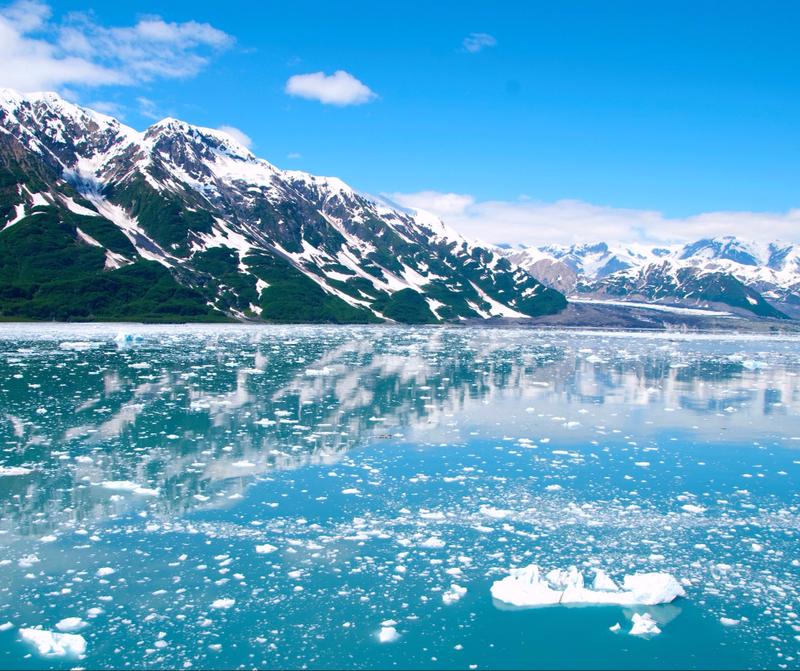 Viewing Lake Clark National Park and Preserve by water is an unparalleled experience. 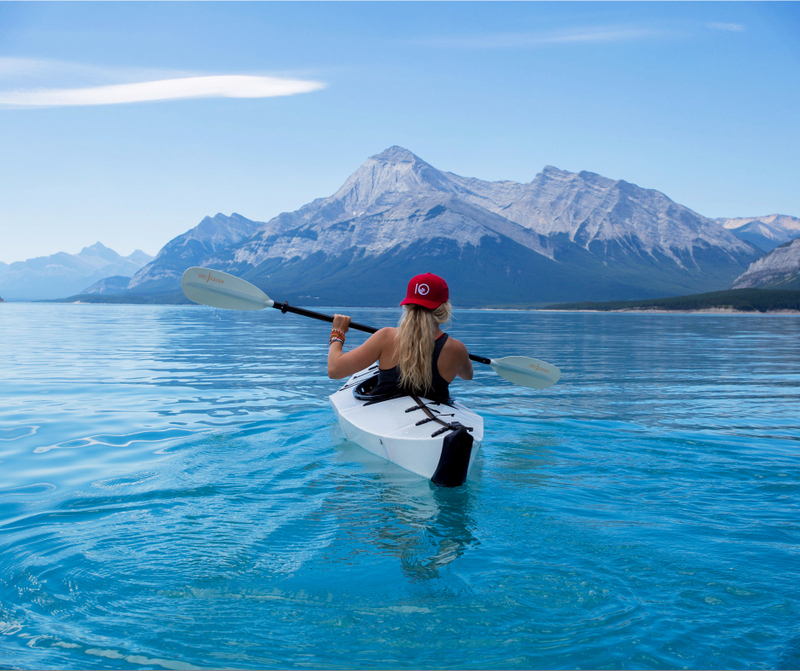 Whether you are seeking a tranquil paddle or a thrilling river run, Twin Lake is a great place to plan your adventure. Both novice and veteran fishers can enjoy sport fishing in this remote wilderness location. If you are up for an invigorating hike, the Hope Creek Valley trail climbs through the lush landscape and features impressive, jagged peaks emerging through the clouds and the sound of Hope Creek rushing below. 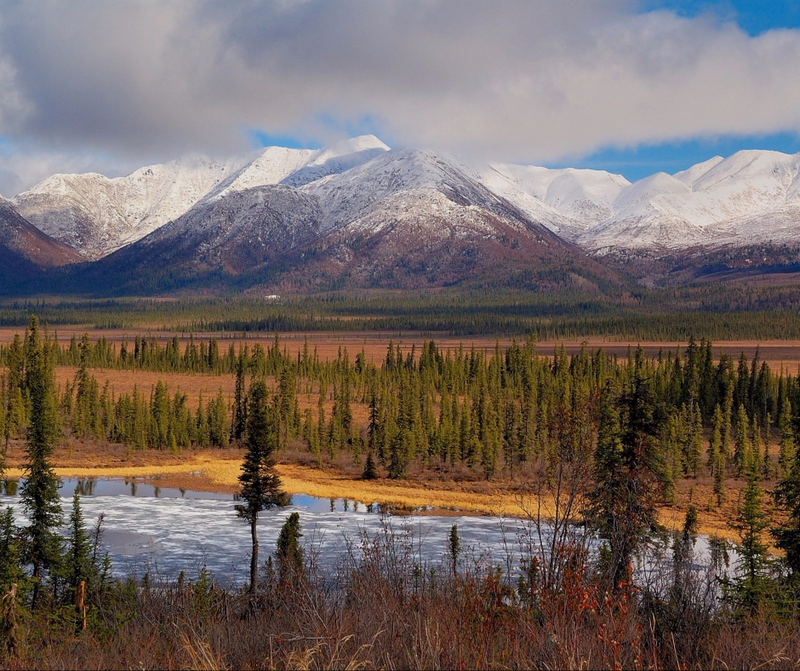 This leisurely trail from the Hope Creek campground leads you to Cowgill Benches, which is the perfect place to pick berries in the late summer and fall, indulge in gorgeous views, and experience rugged Alaskan wilderness. You can experience the home of Alaska’s foremost wilderness icon, Richard L. Proenneke, who built this cabin by hand. Located on the south shore of Upper Twin Lake, Proenneke’s wilderness home showcases his remarkable craftsmanship and reflects his unshakeable wilderness ethic. Project Playground at Twin Lakes provides children of all ages and abilities a place to stimulate their minds and imaginations — and is arguably Alaska’s premier playground. Since its construction the playground has been enjoyed by thousands of Juneau’s children and visitors. Alaska’s capital city boats everything you envision about the state’s natural beauty: snow-capped mountain peaks, immense glaciers, and a wide array of wildlife. Whether you’re interested in nature and wildlife outings, exploring the local art and culture, understanding Juneau’s rich historical background, or all of the above, there is no shortage of sites to explore in Alaska’s capital. 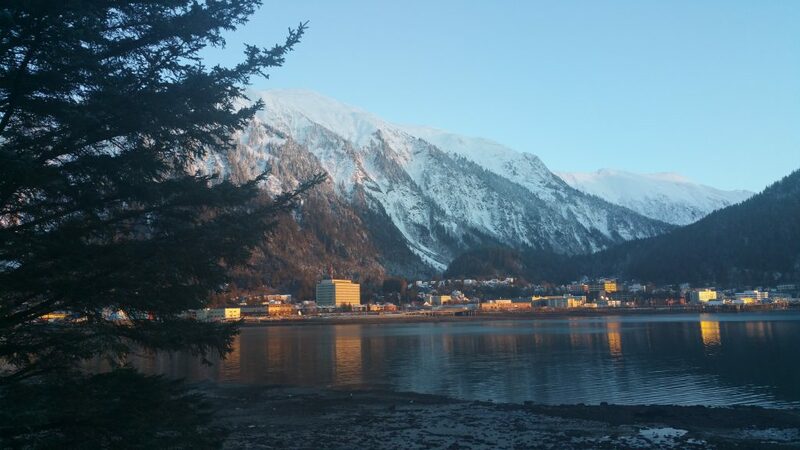 To help you plan your visit, below are five Juneau landmarks that you will not want to miss! 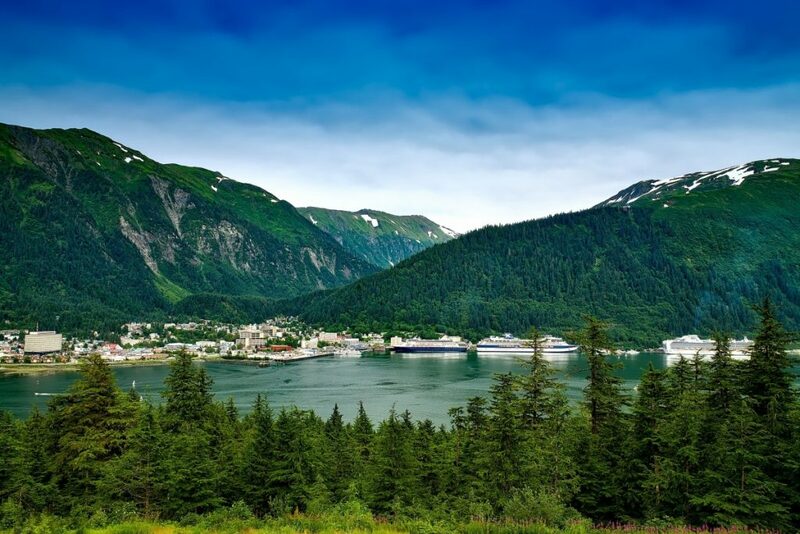 Juneau has countless scenic areas where visitors can experience breathtaking Alaskan landscapes. The Mendenhall Glacier, for instance, spans over twelve miles — from the Juneau Icefield to Mendenhall Lake. Tourists can explore the Mendenhall Glacier Visitor Center free of charge and learn about this unique and spectacular region. Rangers also monitor the visitor center and are available to answer questions about the glacier and the wildlife that inhabit the area. During your visit, make sure you also see the breathtaking Nugget Falls — a 377 foot tall waterfall that cascades into Mendenhall Lake. Mount Roberts is just east of downtown Juneau, making it easily accessible to visitors. In fact, the trailhead is located just after the trestle bridge on Basin Creek Road, making it very easy to locate. The mountain is 3,819 feet in elevation, which certainly makes it a challenging climb, but the initial ascent is much more benign than its counterpart, Mount Juneau. The total length of the climb amounts to approximately five miles. There is a steady rock incline, which makes this trail both challenging an invigorating. You will certainly feel accomplished once you make it to the top! For those unable to complete the full hike, there is the Mount Roberts Tramway, which transports tourists from sea level to 1800 feet up the mountain. Taking the Tramway is also a wonderful experience and a more leisurely way to take in the beautiful views awaiting you at the top of the mountain. Immerse yourself in the rich, local history of Juneau at the Alaska State Capitol. From May through September guided tours are available to provide you with more information about Alaska and its government. Juneau and its frozen surroundings are awe-inspiring from the ground, but to really get a sense of the vastness of Alaska, you need to take to the skies. 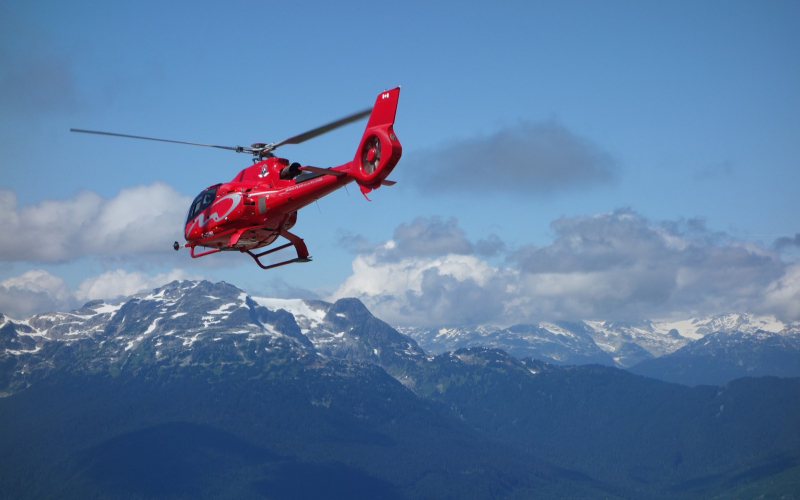 A helicopter tour is the perfect way to add a bit of adrenaline to your time in Juneau. Here, we’ve put together some of the most popular helicopter tours from Juneau. Happy flying! Juneau is surrounded by some of Alaska’s most impressive ice fields, and the best way to see them is by helicopter. Popular options include trips over the fields towards the glaciers of Herbert, Taku, Lemon and Norris. Whichever one you go for, all feature stunning views of sprawling ice fields framed by snow-capped mountains. Expect the tour to take around an hour, and include at least one landing on your glacier of choice. We can help you find the best helicopter tours of the Herbert, Taku Lemons and Norris glaciers throughout the high season if you have limited time in Juneau. If just an hour isn’t enough, then consider taking a longer, full or half day tour of the ice fields surrounding Juneau’s glaciers. Our experienced concierge team is happy to arrange multi-stop trips at popular glaciers like Lemons, Norris, Herbert and Taku. These longer tours should typically include a short hike on at least one of the glaciers themselves. 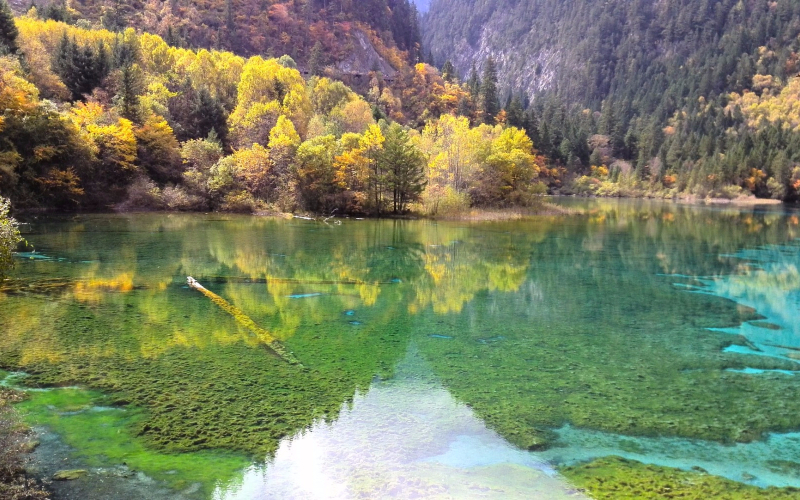 These trips usually include around two hours of hiking on a glacier of your choice, depending on weather. Bear in mind that the hikes are usually around 2 miles, which can be surprisingly hard-going on the ice. If you’re not in reasonable physical condition, consider opting for a shorter trip. If a helicopter trip isn’t enough to get your heart pounding, then why not consider combing your excursion with a spot of dog sledding? After seeing the incredible landscape surrounding Juneau from the air, you’ll then have the opportunity to sled across the other-worldly terrain with the help of a few adorable huskies! These combination trips are extremely popular, and it’s best to book well in advance if possible. Expect the round trip to take anywhere between an hour and a half and three hours. There are three hour helicopter and dog sledding tours on the Herbert Glacier. As mentioned before, book early or you might miss out. If you’d rather see more than just the glaciers and ice fields, consider taking a customizable tour of the coast, alpine interior and even to the Canadian border. These tours go for three hours, and circle around some of the most extreme landscape around Juneau. They include two landings at spots of your choice, with options including waterfalls, glacial lakes and remote woodland areas. The imposing Mendenhall Glacier is easily Juneau’s most well-trodden attraction, but how many visitors get the chance to see this behemoth from the air? A helicopter tour of the Mendenhall Glacier can be one of the most rewarding experiences during your time in Juneau, offering views few people get to see. We can set you on two and a half hour tours that start from the Mt. Roberts Tramway, and include a half hour hike on the glacier itself. If you’re interested in any of these tours please get in touch with us! Our concierge can manage the bookings, coordinate pick up and we have special deals with some of them! Summer is approaching, which means Juneau is getting ready for action. Alaska’s state capital really comes to life in the summer months, when locals take advantage of the good weather to get out and enjoy the best Juneau has to offer. Check out some of the big events coming up around Juneau this year! Throughout the summer months, local guides are available three days a week to welcome visitors and show them around town. Every Tuesday, Wednesday and Thursday tours run from 1:30-3:00pm, starting at the Juneau-Douglas City Museum. Join an enthusiastic local and get the inside knowledge of this warm community. The tour ends at the Capital Inn, where afternoon tea is available. All are welcome to attend, with tickets for adults costing $25, and kids for $20. The walk itself is pretty accessible for the most part, though some stretches include uneven pavement and moderate inclinations. Find more information here. Please bear in mind no tours run on the 4th of July. 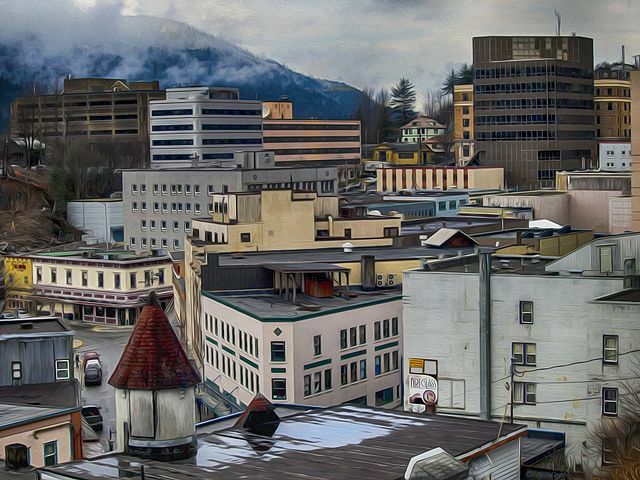 Learn about the history of Juneau and get to know some locals at the annual Gold Rush Days. The two days of festivities take place over June 16-17 at Savikko Park. Along with exhibits, there’s local food, plus games and competitions. Try your hand at the mining skills competition, or unleash your inner lumberjack at the logging tournament. Gold Rush Days is a family-friendly event, and all are welcome. Best of all, entry is free! Find out more here. Who says Alaskans can’t party? On June 17 the Centennial Hall Convention Center will host the fourth annual Juneau GLITZ Drag Show. Expect a night of fun and comedy, with all proceeds going towards supporting Juneau Pride SEAGLA. Prices start at $15, and more details can be found here. 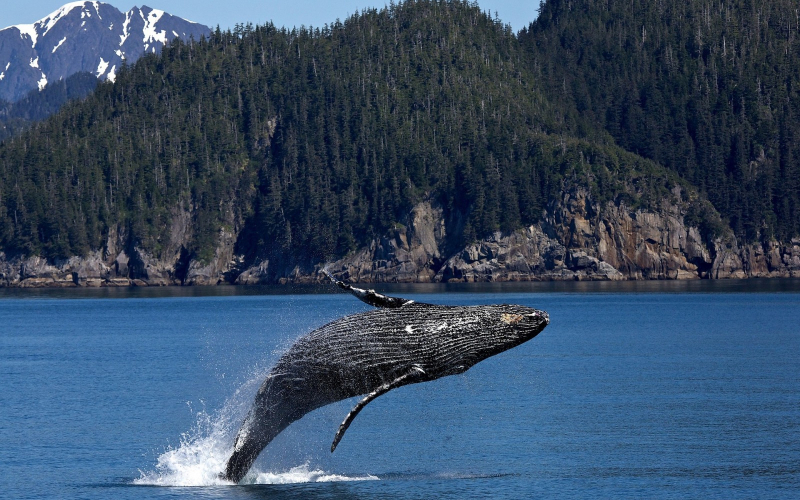 In the summer months, Juneau is a haven for water sports and adventure. The Ken Leghorn Memorial Pack Creek paddle trip takes place throughout summer, and offers budding adventurers the chance to spend three days paddling around the Pack Creek Bear Sanctuary on Admiralty Island. Spend two nights camping with a small group and professional guide. The trip costs a hefty $550, but the float plane trip, food and kayaking gear are all included. Places are extremely limited, and you can find more information here. Learn all about native Tlingit culture while soaking up some of Alaska’s most inspiring wilderness at Icy Straight Point. The site of a historic salmon cannery, Icy Straight Point is managed by a native owned and operated company, which commits to using all profits to support the local community. The offer cruises from Juneau to Icy Straight Point, where visitors can check out an immaculately preserved industrial frontier settlement. The entire settlement revolved around the now preserved cannery. Along with nature trails and tours of the settlement, they also boast some of the best halibut pizzas anywhere in Alaska. Find out more about Icy Straight Point tours here.